✅ entice visitors to take your desired course of action (book a meeting, join your community, make a purchase). Find out how experts and influencers use their Facebook cover photos and be inspired by their examples. Visual Content: What’s the Big Deal? But first, before we dive into the details, I think it’s worth reminding ourselves why so much emphasis is placed on visual content as a whole. ❖ Speed of Communication: To begin with human beings are hard-wired to communicate visually; in fact, 90% of information transmitted to the brain is visual. This visual information is then processed 60,000X faster than text, which is why marketers use of visual content to communicate brand messages. ❖ Social Sharing: Visual content encourages us to share what we see online; content with relevant images are shared twice as much as those without images. ❖ Emotional Connections: Not only that, visual content has the ability to move an audience at a deep emotional. As I explained in my article, “Storytelling for Business”, emotions are the decision-makers, not cold, hard facts. So if a brand is able to move its audience emotionally it has the potential to drive more sales. ❖ Purchase Decisions: When it comes to making purchasing decisions, 93% of those decisions are based on visual perceptions and an incredible 84.7% of consumers say that colour influenced which product they purchased. With these facts in mind think carefully about how you might make the best use of your Facebook Page’s cover photo. You have a very generous piece of virtual ‘real estate’ to showcase your products or services. At the time of writing (February 2018) the correct dimensions for a cover photo on desktop are 820px by 310px. These dimensions will vary, depending on whether you are viewing your Page on a smartphone or tablet. When you download your free template you will see very clearly which areas are viewable on desktop and which areas are mobile friendly. You have just a few seconds to snag a browser’s attention and entice them to take a closer look at the content on your Page. Facebook gives you three great opportunities to do so. ❖ Lead Generation: use a cover photo to direct your audience's attention to your Call to Action button directly underneath, like this example from Sunny Lenarduzzi. Be careful where you place any visual cues like this, since they may not show up on a smartphone or tablet device. You can edit what kind of Call-to-Action to use directly from your Facebook Page by hovering your mouse over the button until you see the option to "Edit Button". Choose from the drop-down menu that appears and select the action you'd like your visitors to take. ❖ Text overlay: although Facebook no longer stipulate that text overlay must be kept to a minimum, it’s never a good idea to add too much text to an image. Keep your image clean and fresh: too much information makes an image look cluttered and confusing. ❖ Image Quality: ensure you use a large, high resolution image file, if possible. If an image is too small and has to be stretched to fill the template it will lose its sharpness and may even look pixelated. Not the kind of professional image you want to portray. ❖ Canva: a free graphic tool which is available on desktop, tablet and now smartphone. ❖ PicMonkey: a great photo editing tool which costs only $4.99 per month to use, value for money! Facebook’s CEO, Mark Zuckerberg, has made no secret of his desire to increase the use of video on Facebook, ”I see video as a mega trend, same order as mobile”. So it was no surprise when in 2017 Facebook rolled out the option to upload a quick video file as an alternative to a static Facebook cover image. What can you learn from these well-known brands? ❖ Resolution: must be 1080p (full HD resolution). Most smartphones can record quick videos perfectly with adjustable settings. ❖ Tools / Smartphone Apps: editing and customising your video will ensure you stamp your own brand's personality onto it so it stands out from the crowd. There is a great range of desktop tools and smartphone apps available to help you do this, some of which are free and others are paid. Use your free template to create a series of slides and upload them onto your Facebook Page. ❖ You only have 5 slides to play with so be sure to plan what message you want to convey and how to do it as succinctly as possible. ❖ Do not be tempted to add too much text to your slides: it won’t be read and it may even turn visitors away from your Page. ❖ Use your slides to showcase a product, an event, start a conversation or introduce team members to your followers. ❖ Include a visual cue to direct visitors to your Call-to-Action button on the final slide to generate new leads. 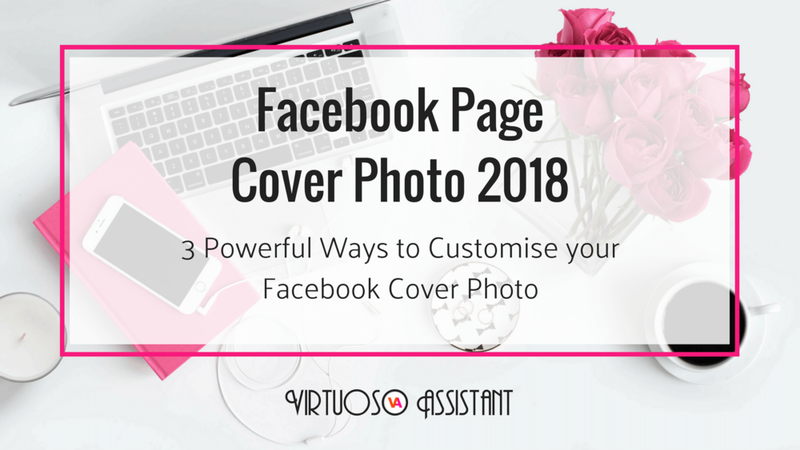 I mentioned at the start of my blog that I'd be giving away a free template so you can create your own, correctly sized Facebook cover photo. Just click this link which will take you over to your Canva account; you can start editing and customising the template for your own brand. Would you like more Facebook templates? Or, knowing how increasingly important video is, would you like a template to help you create stunning channel art for YouTube (it's a tricky image to get right)? Let me know by dropping your comments and suggestions in the box below.